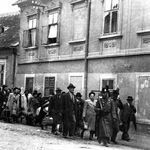 From May 14 until July 9, 2014, the internet news portal Origo.hu's banner highlights the number of Jews deported by wagon from across the Hungarian countryside to Auschwitz and other death camps, seventy years ago to the day. The "Menetrend" (Timetable) Hungarian-language blog, edited by OSA historian András Mink, follows the history of the deportations on a day-to-day basis. Seventy years ago on May 14, 1944, the first trains destined for Auschwitz left Nyíregyháza in eastern Hungary. In 57 days, 147 trains deported 437,000 people to death camps, where the overwhelming majority (85%) were killed within hours of arrival. Every day until July 9, 2014, the Menetrend blog will name the town from which Jews were deported on that day, and the number of deportees will also appear in Origo.hu's banner. An English translation of the Origo article on the 70th anniversary of the start of the deportations is available at the Budapest Beacon.